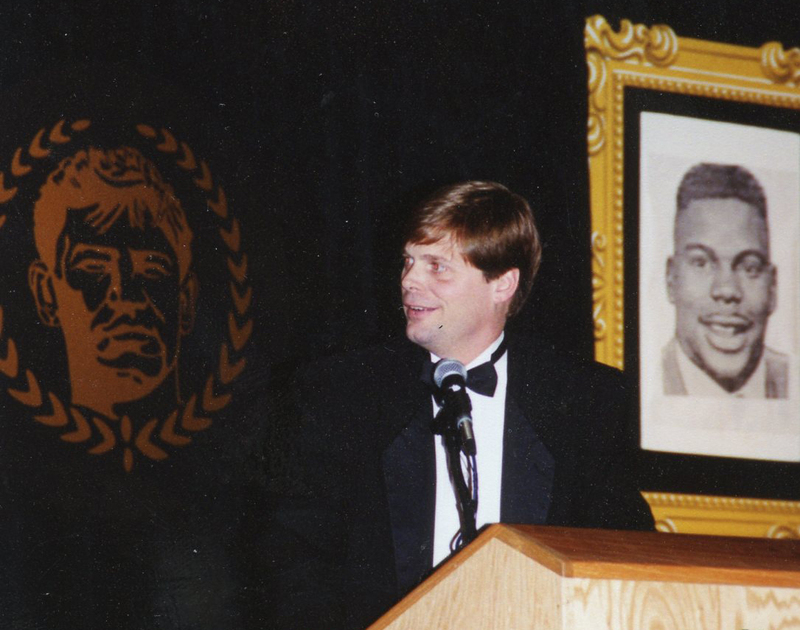 Blair Kerkhoff of the Kansas City Star was named the FWAA’s Bert McGrane Award winner on Monday. The prestigious award is tantamount to the organization’s Hall of Fame. Authored five books, four about college sports. Winner of APSE national awards and state writing awards in Missouri and Virginia. Three children: Nate, 29, was a Volney Meece Scholarship Recipient (2007), Ben and Anna. Karen, wife, of 34 years. Influences/Mentors: I was influenced by the sportswriters of newspapers wherever we lived, plus those who wrote for Sports Illustrated, Sport magazine, The Sporting News and any other publication that came through our home. Growing up in Raleigh, I’d attend college football games or listen to them on the radio, take notes and scribble short stories on a legal pad then compare it to the game story in the next day’s newspaper. The first college football game I attended was in 1971, William & Mary at North Carolina. The Tar Heels beat Lou Holtz’s team 36-35 with a late touchdown and two-point conversion. I was hooked. The next year I attended every N.C. State home game, walking to the stadium from my home about two miles away. I’d go to North Carolina and Duke games during the day and watch the Wolfpack at night. Rewarding Stories: If you live in the same place for as long as I have, sometimes you’re privileged to write about people who have influenced you or your family. A few years ago, a coach, teacher and fantastic person at a local high school died at the shockingly young age of 47. Two of my kids had him as a coach, the third as a teacher and by the end of the day without prompting they had all shared a story about him with me. I was able to construct a tribute from those recollections. I’ve covered every college football championship game since 1995 and a half-dozen or so Division II championships. Sometimes the better stories and certainly better access is found with the smaller schools. Best Advice: Do your homework, and always be prepared for an interview, event or game that you’re covering. I heard this from more than one mentor. If I could advise aspiring journalists, build a foundation on the fundamentals of writing and reporting, develop contacts and understand how to use them. Be fair and accurate, and don’t think any assignment is beneath you. For veterans, do your best to keep up with the changing technology, be open to video and audio. The audience doesn’t always come to you like it once did. You have to find the audience and give it a reason for repeat business. Best Moments: Too many to count. *Riding in a limo and chatting with Eddie Robinson on the way to an awards banquet. *Sitting in a conference room with every conference commissioner as the BCS was being planned. *Nearly getting tossed in the Riverwalk, accidently I think, by Nebraska fans before a Big 12 title game. *Taking the media bus back to the hotel from Boise State’s dramatic victory over Oklahoma in the Fiesta Bowl, thinking I had captured the essence of this remarkable game, only to learn about the marriage proposal while listening to a radio show, and scrambling at the hotel to add that detail. *Having beers with Joe Paterno the night before a game, about the time the bad stuff was happening and wouldn’t be known for more than a decade. *A recurring one: Having the privilege to vote on the Good Works Team and Armed Forces Award. Best interview: I can’t single one out, but I covered Frank Beamer’s first two years at Virginia Tech. I was the only media member on a regular basis and instead of using that numbers advantage to shut me out, Beamer and his staff opened their doors and allowed me to gain insights into the team. What the FWAA has meant: My year as FWAA president was incredible for a few reasons. I was the last person selected by Volney Meece to serve as an officer and enter the president rotation. It allowed me to get to know Volney, one of the greats in our profession. After Volney passed the FWAA plunged into uncertainty. I remember at the Nebraska-Florida Fiesta Bowl after the 1995 season. Ivan Maisel was President. At the annual meeting, he was there, along with Vahe Gregorian and myself. We discussed a path forward for the organization and we came up with expanding the directory. At the time it looked more like a pamphlet. Soon, it became a media guide. Not long after that, Tiger Richardson took over and the FWAA has become a model of stability and a positive force in our profession. Receiving the Bert McGrane Award: If I’m around next July, it will be 30 years for me at The Kansas City Star, mostly covering college sports. I greatly appreciate that my bosses have found it worthwhile over the years to send me college football’s title game, and I hope whatever audience I have also found it worthwhile. Winning the Bert McGrane Award is an incredible honor. The roll call of winners includes people who have gained my admiration and readership for decades. There are more deserving of this award, none more appreciative. ATLANTA — On the day of the fourth College Football Playoff National Championship Game, Steve Wieberg receives the FWAA’s prestigious Bert McGrane Award, tantamount to the organization’s Hall of Fame. 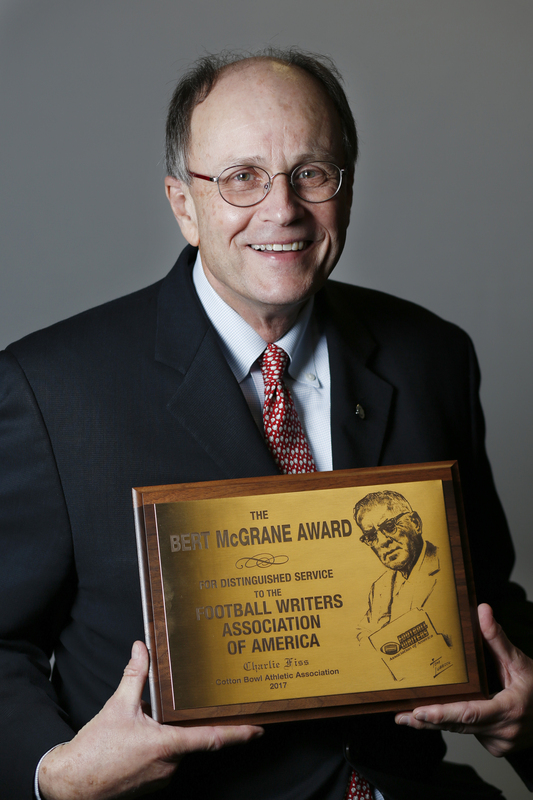 Wieberg will accept the McGrane Award at the FWAA’s Annual Awards Breakfast at the Sheraton Atlanta Hotel. It was an honor well-deserved not only for his ground-breaking role on the CFP Selection Committee, which helped determine the four playoff teams the last four years, but for his long career at USA Today from 1982 to 2012. 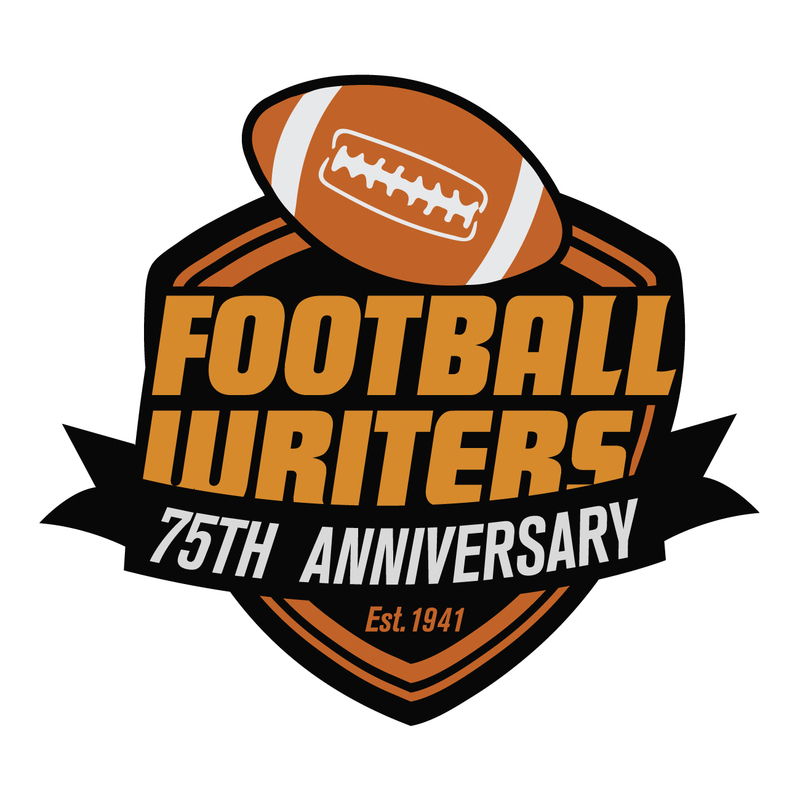 “Stunned, incredibly grateful and humbled by the greats who have won it and just as much by those who haven’t,” Wieberg said upon learning he was the recipient of the award that goes to a person who has performed great service to the FWAA and/or the writing profession. 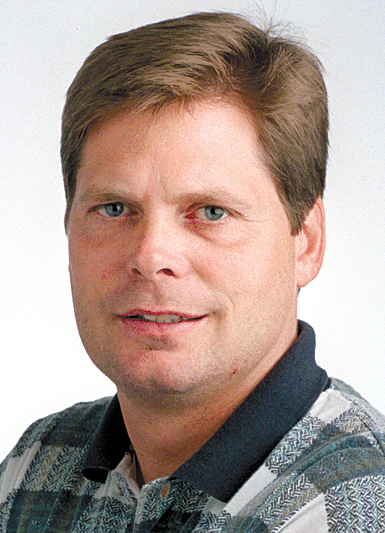 In 2014, Steve Wieberg became a past media member on the first CFP Selection Committee. After completing a four-year stint on the committee, he undoubtedly has paved the way for future past media members to be a part of one of college sports’ most influential bodies. “Steve’s position on the committee was, well, sort of a breakthrough in college sports,” said FWAA Executive Director Steve Richardson. “But it goes to show you there are those in the media who generate great respect from those they have covered over the years. The McGrane Award was established in 1974 as a memorial to Bert McGrane, long-time Des Moines Register-Tribune sports writer who was one of the founding members of the FWAA. He was the FWAA’s executive director from the early 1940’s until 1973. “When we decided it would be great to have a former reporter on the selection committee, Steve came to mind immediately,” CFP Executive Director Bill Hancock said. “And he exceeded our high expectations. He contributed with his wisdom, analytical mindset and thorough research. Wieberg said he went on the committee with two priorities. Getting the selections right would reinforce the new playoff system. “I also have been keenly aware that I would represent the writers and other media on this committee, and it has been important to me to do a good enough job to validate the CFP’s decision to give us that seat at the table,” he said. 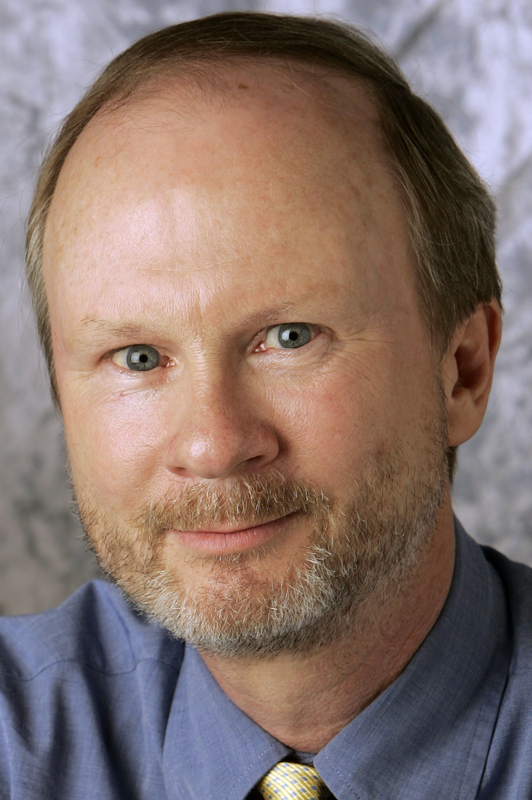 Wieberg forged an award-winning career in journalism at USA Today. He was a frequent winner in FWAA, USBWA and Associated Press Sports Editors contests as well as a recipient of several other awards. A University of Missouri graduate, Wieberg was able to build an extensive network of relationships across the country that had few equals. He could break stories on the national stage as well provide the reader with insight as to why they were happening. TAMPA —The Cotton Bowl Athletic Association’s Charlie Fiss is in the unique position to accept a second Bert McGrane Award today at the FWAA’s Annual Awards Breakfast. Only this Bert McGrane Award he gets to keep. About 17 years ago, Fiss accepted the Bert McGrane Award on behalf of the late Field Scovell and then turned the plaque over to the family after he returned to Dallas from the presentation at the College Football Hall of Fame in South Bend, Ind. Fiss, in his 33rd year working for the Cotton Bowl, becomes the fourth person from the CBAA to receive the Bert McGrane Award, which is presented annually to a member of the FWAA for distinguished service to the organization and college football. Wilbur Evans (1978), Jim Brock (1989) and Scovell (1999) are the other CBAA recipients. 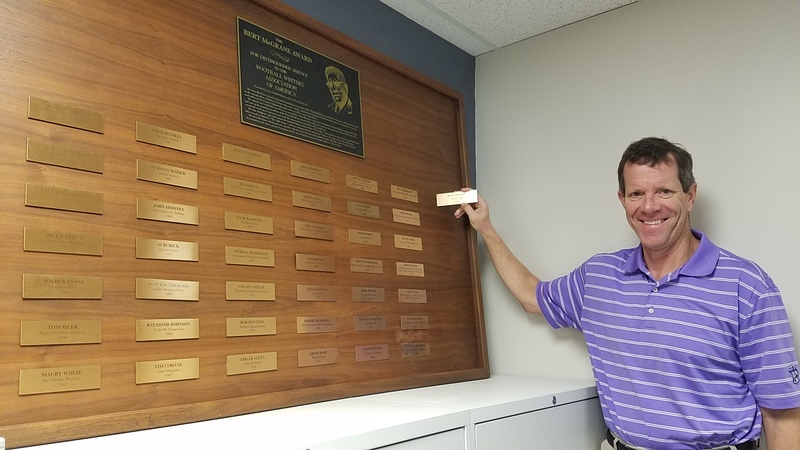 The Award was established in 1974 as a memorial to McGrane, long-time Des Moines Register-Tribune sports writer who was one of the founding members of the FWAA. He was the FWAA’s Executive Director from the early 1940’s until 1973. Richardson added: “He is meticulous. Period. End of story. He stews over the mailing list and all parts of the directory he is responsible for and some that he is not. He has been a champion of the FWAA in terms of what is provided during his bowl week — access to players and coaches and maintaining strict standards of decorum in the press box itself. His first Cotton Bowl was in 1984, during which time he was serving as the Assistant Director of Media Relations for the Southwest Conference from 1984-1993. In 1994, Charlie was hired by the CBAA to serve as the Vice President of Communications and became a fulltime member of the staff. Through his 30-plus years with the Cotton Bowl, he has worked with six Heisman Trophy winners, including Boston College’s Doug Flutie in his very first Cotton Bowl game. Charlie is a graduate of the University of Arkansas, where he served as the Men’s Media Assistant from 1976-1980, and then as the Women’s Athletic Director of Media Relations from 1980-1984. As an avid racehorse fan, Charlie still volunteers for the Kentucky Derby at Churchill Downs, where he has done so for more than 25 years. In between trips to Great Britain to feed his Beatles’ craze, annual pilgrimages to Disneyland to pay homage to Walt and strumming the guitar, Charlie still runs the Cotton Bowl Media operations by commuting from Phoenix, where he resides. “Whoever would have dreamed I would have even seen one Heisman Trophy winner much less work around six,” Fiss said. “I got to know Darrell Royal and Frank Broyles, all these people you read about in the sports pages, you know when you are growing up. … It really has been an interesting life. I have been blessed and pretty lucky to be involved in this business. These photos were taken at the FWAA’s annual Awards Breakfast on Jan. 11 in Scottsdale, Ariz. Winners of the 2015 Best Writing Contest as well as the Bert McGrane Award winner were honored, among others. The FWAA’s annual Awards Breakfast took place at the J.W. Marriott hotel in Scottsdale, Ariz., on Jan. 11, 2016. Photo by Melissa Macatee. 2015 FWAA President Lee Barfknecht greets member Steve Wieberg, who serves on the CFP Selection Committee, at the FWAA’s annual Awards Breakfast on Jan. 11 in Scottsdale, Ariz. Photo by Melissa Macatee. 2016 FWAA President Mark Anderson of the Las Vegas Review-Journal (left) has a few moments with Irv Moss of the Denver Post, the winner of the FWAA’s Lifetime Achievement Award. Photo by Melissa Macatee. The Armed Forces Merit Award was among the honors distributed at the FWAA’s annual Awards Breakfast on Jan. 11, 2016, in Scottsdale, Ariz. Photo by Melissa Macatee. Chris Dufresne, who recently retired from the Los Angeles Times, received this commemorative football as the 2015 FWAA Beat Writer of the Year. Photo by Melissa Macatee. Chris Dufresne, who recently retired from The Los Angeles Times, speaks to FWAA members after being honored as the 2015 FWAA Beat Writer of the Year. Dufresne served as president of the FWAA in 2013. Photo by Melissa Macatee. Pete Thamel of Sports Illustrated received this commemorative football in recognition of his first-place in the features category of the FWAA’s 2015 Best Writing Contest. Photo by Melissa Macatee. Irv Moss of the Denver Post received this commemorative football in recognition of his Lifetime Achievement Award. Photo by Melissa Macatee. Irv Moss of the Denver Post, who was honored with a Lifetime Achievement Award by the FWAA. Photo by Melissa Macatee. Past President Tony Barnhart introduced Bert McGrane Award winner Ivan Maisel, another past president. Photo by Melissa Macatee. Ivan Maisel of ESPN.com, winner of the Bert McGrane Award, sits with his mother at the FWAA’s annual Awards Breakfast on Jan. 11, 2016. Photo by Melissa Macatee. 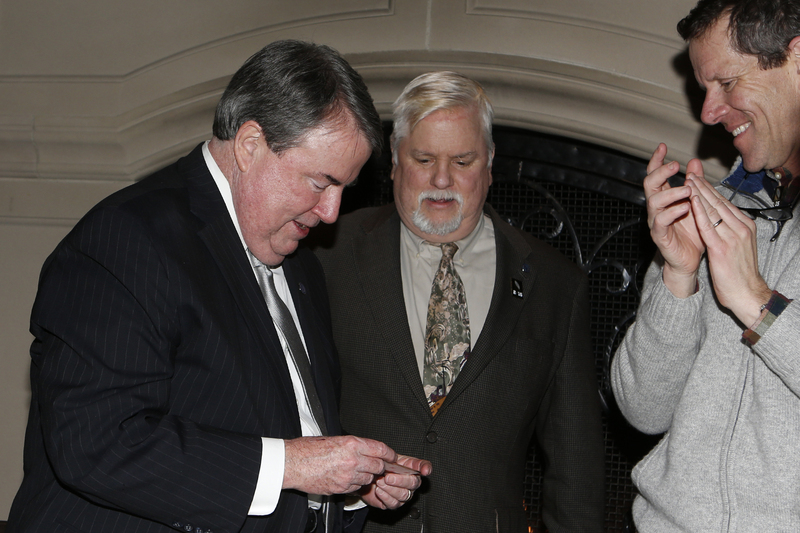 Tony Barnhart (left) and 2015 FWAA President Lee Barfknecht present the Bert McGrane Award to Ivan Maisel of ESPN.com at the FWAA’s annual Awards Breakfast on Jan. 11, 2016. Photo by Melissa Macatee. Ivan Maisel of ESPN.com holds his Bert McGrane Award. Photo by Melissa Macatee. Ivan Maisel, winner of the Bert McGrane Award, is joined at the FWAA Awards Breakfast by his wife, mother, other family members and friends. Photo by Melissa Macatee. 2015 FWAA President Lee Barfknecht takes the podium one final time as president during the annual Awards Breakfast. Photo by Melissa Macatee. Lee Barfknecht accepts the Outgoing President’s Plaque at the FWAA’s annual Awards Breakfast no Jan. 11, 2016, in Scottsdale, Ariz. Photo by Melissa Macatee. Mark Anderson accepts the job as the 2016 FWAA President. Photo by Melissa Macatee. Ted Miller of ESPN.com accepted a commemorative football and certificate for first place in the column category of the FWAA’s 2015 Best Writing Contest. Photo by Melissa Macatee. The Armed Forces Merit Award was among the honors handed out at the FWAA’s annual Awards Breakfast on Jan. 11, 2016, in Scottsdale, Ariz. Photo by Melissa Macatee. Lockheed Martin Armed Forces Bowl Executive Director Brant Ringler presents the Armed Forces Merit Award to Bret Robertson, an Army veteran who plays safety for Westminster College in Missouri. Photo by Melissa Macatee. 2015 FWAA President Lee Barfknecht and his wife, Sara, pose with the CFP national championship trophy at the FWAA’s annual Awards Breakfast on Jan. 11, 2016, in Scottsdale, Ariz. Photo by Melissa Macatee. “Dan Jenkins, then and now; the late Ron Fimrite, who not only wrote with a clean grace and a man-about-town style, but showed me how to treat my subjects; Steve Wulf, who taught me how to make the little anecdote tell a bigger story; Dave Smith, who hired me at The Dallas Morning News and put me on the national college football beat, if not on the front of the Sunday sports section; and my friend and colleague for the last 13 years, David Duffey, who shares my passion and sensibility about what makes a story. DALLAS — The Football Writers Association of America announced Tuesday that National Football Foundation President and CEO Steve Hatchell has been named the 2015 recipient of the FWAA Bert McGrane Award. The official announcement was made during the annual FWAA Annual Awards Breakfast at the Renaissance Dallas Hotel in front of the FWAA members and the national media that had assembled to cover the College Football Playoff National Championship Game, which had taken place the previous day. “We have a small but powerful team at the National Football Foundation that has been together for more than eight years and cares deeply about the sport, including Matthew Sign, Ron Dilatush, Hillary Jeffries, Philip Marwill, Will Rudd and Sue Tuggle,” said Hatchell. “The success of the Foundation has only been possible because of the support and vision of a great board of directors, and they have has allowed us to keep the staff together and make it happen. 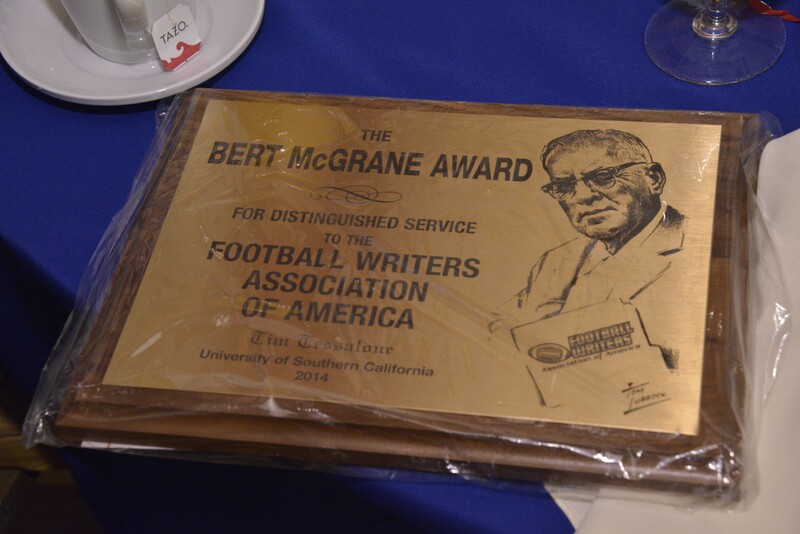 USC’s Tim Tessalone is the 41st winner of the Bert McGrane Award, which is annually bestowed on a member of the Football Writers Association of America. He has served college football for more than three decades as the Trojans’ sports information director, helping writers in their jobs as well as promoting the school’s athletic teams — both in exemplary fashion. The McGrane Award, symbolic of the association’s Hall of Fame, is presented to an FWAA member who has performed great service to the organization or the writing profession. It is named after McGrane, a Des Moines, Iowa, writer who was the executive secretary of the FWAA from the early 1940s until 1973. Tessalone will receive the award during the FWAA’s Annual Awards Breakfast on Jan. 6 at the Newport Beach Marriott Hotel and Spa, the media hotel for the VIZIO BCS National Championship game, played at the Rose Bowl in Pasadena. “I am humbled and honored to receive an award that not only is named after a man who served the FWAA so well, but that has been presented previously to icons who are well above me in stature and ability,” Tessalone said. “It is a privilege to be in their company. Thank you to the FWAA membership, with particular gratitude to Chris Dufresne (2013 FWAA President) and Mark Blaudschun (1999 FWAA President).